Alola! Consider that your official welcome to Gameological’s Game In Progress coverage of Pokémon Sun and Moon. Over the next several weeks, William Hughes and Nick Wanserski will be making their way through Nintendo’s latest monster-training adventure, playing the same section of the game together and serving as your tour guides to Alola, its quasi-Hawaiian setting. William, a longtime fan of the series, will be playing Moon and providing an eye toward what’s new or different. Nick is a series newcomer and will be bringing his fresh perspective to Pokémon Sun. This first report covers everything from the start of the game through their time on its first island, Melemele. The first thing I’ll note about my time with Moon is how damn good it all looks. Game Freak stuck with the same 3-D models they used in 2013’s Pokémon X and Y, but the studio has brought an even heavier focus on cinematic presentation. Because I’m playing Moon—which time-shifts its in-game clock 12 hours from my own in Portland—I’m also getting a lot of chances to see how good its night-time lighting can be, giving everything a pleasant soft-focus feel. Given how long the Pokémon games managed to stick to their top-down, bare-bones aesthetic, it’s really nice to see them embrace some visual flare and varying camera angles. And the soundtrack is consistently great, tapping into the new faux-Pacific setting without going over the top. The game kicks off with a video call from Sun and Moon’s resident Pokémon professor, Kukui, a man with a disturbing willingness to barge, shirtless, into the homes of preteens he barely knows. But while the good professor verges on being just a little too “X-TREME” at times, Kukui’s a good introduction to the game’s lively writing and energetic tone. (See also: a reference to “humble bragging” that got a surprised laugh out of me, and the bone-headed antics of the latest Team Rocket stand-ins, Team Skull.) The Pokémon games have always been aggressively cheerful in tone, but I’ve been happily surprised by how well-drawn Sun’s and Moon’s initial characters have been—Kukui, island chief Hana, and even the player’s normally faceless mom. How about you, Nick? 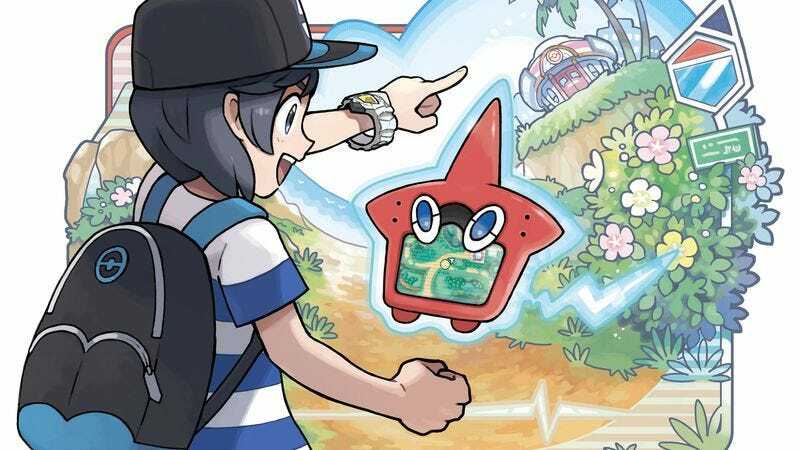 What were your first impressions of Alola? As dramatic as it may sound, playing a Pokémon game right now is proving to be a balm for my bruised soul. I’ve always enjoyed Nintendo’s commitment to making and publishing games with cheery, brightly hued aesthetics, and I’m grateful they continue to do so even after that look has largely fallen out of fashion. You’re right that the soft, pastel nighttime effects are lovely, and right now, spending time in a world where everyone is so out-of-their-damn-minds happy to just wake up in the morning is a welcome counterpoint to my previous week. Of course, that constant effervescence also invites reflection on how truly weird these games are. I know it’s an observation as old as the series itself, but the unerring tone of wholesome enthusiasm and good sportsmanship demonstrated by the trainers you battle feels pretty at odds with the game of fantastical cockfighting in which you’re engaged. Consequence-free battles are such a baked-in video game abstraction that I wouldn’t give the contradiction much thought if it weren’t for Lillie, the mysterious ingenue your character meets at the beginning of the game. She carries a mysterious Pokémon in a duffel bag that she’s very protective of and constantly references how she doesn’t duel because she can’t stand to see the creatures in pain. It makes me feel a little guilty for wandering out into the grass to forcefully conscript members into my ever-increasing army of goofy animal thralls. But at the same time, I gotta find a water Pokémon. Speaking of which, are Sun and Moon pretty typical of the difficulty of most Pokémon games? It’s been pretty effortless so far, and I haven’t had any problems winning either the random or scripted encounters. I haven’t played a one-on-one role-playing game since the copy of Dragon Warrior for NES I got for free with a Nintendo Power subscription, and I find it a welcome change from managing a giant party. Can I expect the challenge to ramp up as I build up my collection? I know the game is predicated on a rock-scissors-paper dynamic, where each Pokémon is weak to certain types of moves, and I don’t know how stunted I may be in the future if I don’t strategize for a good team now. What do you think of the trials, Nick? And have any of the game’s features stood out to you as interesting or hard to use? You’re demonstrating true Christian charity by choosing the poor, unloved Popplio, William. I have no doubt that you’ll grow to love her by the end of the game. So far I’ve been pleased with my choice of Rowlett. Hootenanny, as I’ve named him (after the Replacements album, not a pun based on the sound owls make), has been a pretty successful anchor for my team; though as you point out, the preponderance of aerial creatures at the beginning of the game blunts the benefit of starting with a flier. But I can look past that because of his cute leaf bow tie. In fact, I’m very impressed with the Pokémon designs in general. Sure you get the occasional nightmare ocean clown, but the game does a wonderful job of translating the energy present in the illustrations into animated models. As for interesting or hard-to-use features, everything included in the first island is pretty straightforward. I’m hoping things get more interesting with the “Z-power” system you mentioned. So far, pairing the Z-power crystal with the appropriate Pokémon can be a little underwhelming. If you’ve switched out most of the powers a given crystal boosts, you’re left with an underused or unusable super-ability. That said, I do understand what you were saying earlier about the challenge of the fights being in the complexity. I’d go through a whole string of trainers effortlessly, only to challenge one who was using a Pokémon type I had no defense against and have to go through my entire roster just to stay on top. I like the balance of grinding and strategy necessary to have a successful team. I’m also grateful that tall grass, the designated random encounter area, is for the most part optional. Other than a handful of locations, you’re never forced to walk through Pokémon-infested waters to reach your destination, which is good, since the absurdly high encounter rate in grassy areas would slow the game to a turgid slog. Have you spent much time with the game’s online features? I briefly opened up the “Festival Plaza” feature and almost instantly regretted doing so. It’s a hub where you can battle and trade with other players, but the whole thing is buried under the suffocating premise of deputizing your player as the greeter for some mystical online fairground. The plaza notwithstanding, I enjoy the game’s superfluous activities, like clothes shopping and getting haircuts. It’s the kind of fluff that helps break from the nonstop animal feuds. Because we’re playing this first part of the game under embargo, I haven’t had a chance to mess around with the online features yet. (Although my natural competitiveness is looking forward to battling it out with you once we do.) I do offer a similar eye roll to the theme of the Festival Plaza, though, which offers up a bunch of cutesy, quasi-useful shops and little in the way of actual gameplay weight. I’m sure once the Plaza opens up for battles and trading, I’ll get used to it and breeze past the more annoying elements—looking at you, characters with Miitomo-esque survey questions galore—but for now, the Plaza is indicative of a problem I’ve had with modern Pokémon games for a long time now: feature bloat. To put it bluntly, Pokémon has a mini-game problem. I can’t count how many times I’ve abandoned an entry in the series because I couldn’t take being asked to enter one more beauty pageant or got bogged down playing a rudimentary first-person shooter when I should be catching monsters and logging them in my Pokédex. I don’t begrudge Game Freak for wanting to give people a lot of options for stuff to do; the Pokémon games have always had a strong vein of Animal Crossing-esque self-direction built into their DNA (once you get off the airtight rails of the main plot, in any case). But I want those mini-games to be part of the whole. Moon is better about this than most of the games in the series. When I’m (reluctantly) petting my Popplio in the Nintendogs-esque Pokémon Refresh, for example, it’s to clear up lingering status effects or improve her performance in battle, not part of some whole other system. It’s still kind of a distraction, but at least it’s one that ties back into the core monster fighting, in a way that’s been lacking in previous games. I think that about wraps this week up for me, Nick. Do you have any more thoughts about the game before we bid Melemele Island farewell? I think we’ve covered pretty much everything there is to cover through the first island. It’s been a pleasure to hear your thoughts so far, and I look forward to checking in again as we get further along.